which is completely corrected with use of glasses. 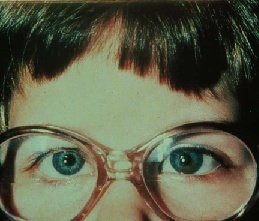 Esotropia in young children may be partially or completely accomodative. 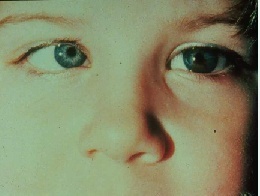 Usually the more hypermetropic eye shows a constant esotropia, and may become amblyopic if untreated. The deviation increases when the child focuses a near object. Treatment should be started early to prevent amblyopia. After doing a full cycloplegic refraction (Atropine tds for 3 days) appropriate correcting glasses are given for constant use. The parents are asked to enforce wearing of glasses, if necessary by using an elastic headband to prevent glasses being removed by the child. This may be supplemented by occlusion therapy for anisometropic amblyopia, if necessary. The refraction is repeated 6 to 12 monthly and necessary changes made to the spectacle power. The power of glasses usually decreases with age, but many children may have to use glasses lifelong. The use of long acting parasympathomimetic agents is on the decline. However some children may benefit from ecothiophate iodide (Phospholine Iodide). The possible side effects include iris pigment hypertrophy, prolonged miosis and cataractogenesis.